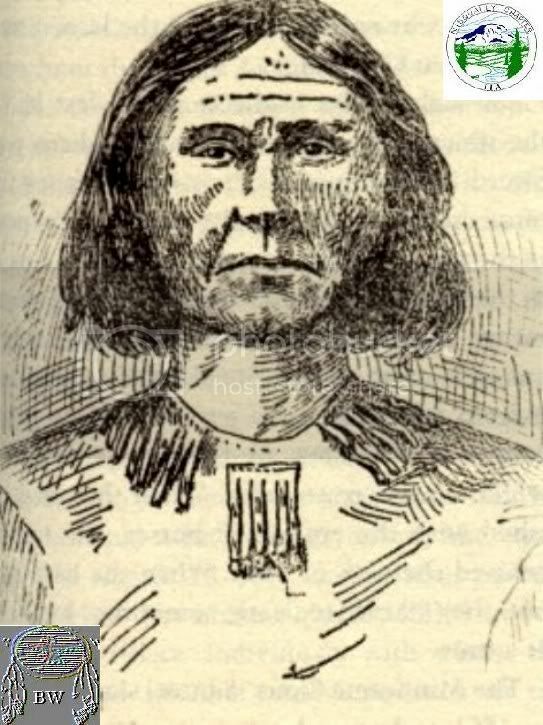 Chief Leschi was one of the principal leaders in the Yakima War, the armed resistance in 1855 and 1856 to treaties negotiated by Washington terretorial governor Isaac Stevens. The guerilla war at one point spilled westward over the Cascades in a raid on the Puget Sound settlement of Seattle, after which Leschi was caught and hanged. Beginning in 1843 and continuing until the middle 1850s, Stevens negotiated at least half a hundred heavy-handed treaties with Native peoples of the Pacific Northwest. Many of the Native people felt insulted by the treaties, which cajoled and threatened them into signing away 157 million acres. The 1855 Walla Walla Treaty galled them the worst. The Yakimas, claimed that Stevens had bought off their leaders, recruited allies from several other tribes and waged a guerilla war against the U.S. army that spread over the mountains to the Pacific Coast. The army brought the rebellion under control after three years of occasionally blood fighting. During the rebellion, Dr. Marcus Whitman (who, it was said, had come to the Walla Walla area to civilize the Indians with a bible in one hand and a whip in the other) was murdered, along with his wife and twelve other whites. A freelance posse formed immediately and hanged five captured Cayuse in retribution. Leschi attacked the newly established settlement of Seattle on February 29, 1856, with about one thousand warriors. The warriors might have overrun the settlement, except that a navy ship that happened to be stationed in the harbor opened fire on them. After his force was defeated, Leschi surrendered to the U.S. army. Initially, Leschi was offered amnesty, but Governor Stevens, who was determined to bring Leschi to trialfor deaths occurring during the raid of Seattle, took up his case as a personal matter. He is said to have bribed one of Leschi's warriors with fifty blankets to betray him.